It was a busy August for doctors — and spouses — Patrick Yassini, M.D., and Katee Afshar, D.D.S. In what turned out to be a bit of a “space race,” both doctors moved into new Coronado medical offices, built from the ground up. Both spaces feature a spa-like ambiance that makes a trip to the doctor — or dentist as the case may be — a welcoming experience. Both doctors began construction in February and, by a nose, Afshar beat her husband in opening her new dental practice at 1111 Ninth Street, Suite 203, on August 3. 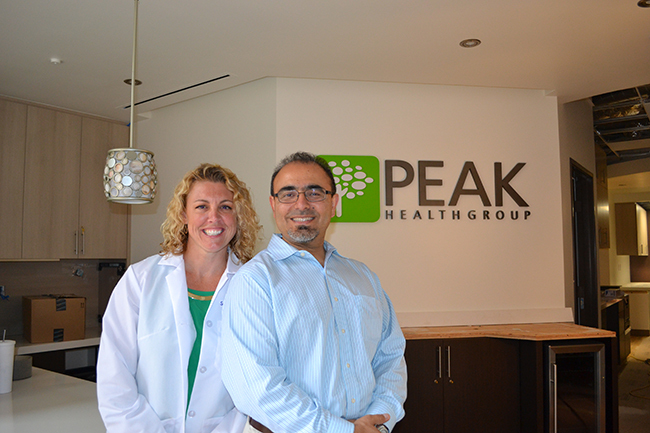 Two weeks later, on Aug. 18, Yassini opened his new Peak Health Group office at 131 Orange Ave, Suite 100. Afshar spied a construction sign for a building going up on Ninth Street last October. Knowing commercial space is at a premium in Coronado, she quickly contacted the building’s developer, Dave Gillingham. Meanwhile. Yassini purchased a first-floor office suite at the Coronado City Views mixed-use development, which is quickly becoming a medical hub. Plastic surgeon William Shuffett and liver and hepatology specialist Tarek Hassenein also have offices in the complex. By city code, the Orange Avenue frontage of Yassini’s space needed to be retail and he leased it to a new hair salon, Stella Blue Salon and Color Bar. Afshar’s spacious second-floor suite (elevator service is available) includes three examination rooms, a private office, a relaxation room with massage chair, a children’s playroom and a spacious lobby and reception area with soaring ceilings. Beach-wood floors and natural wood ceilings are reminiscent of the beach, as are the aqua furnishings. A native of San Diego, Afshar has been a dentist for 15 years, and is a graduate of No. 1-ranked University of the Pacific Arthur A. Dugoni Dental School. Over the past 12 years, she practiced in Tierrasanta, where her office included many specialists. She sold that to make the move to Coronado. The doctors live in Coronado and are the parents of Kiana, age 10, a student at Christ Church Day School. 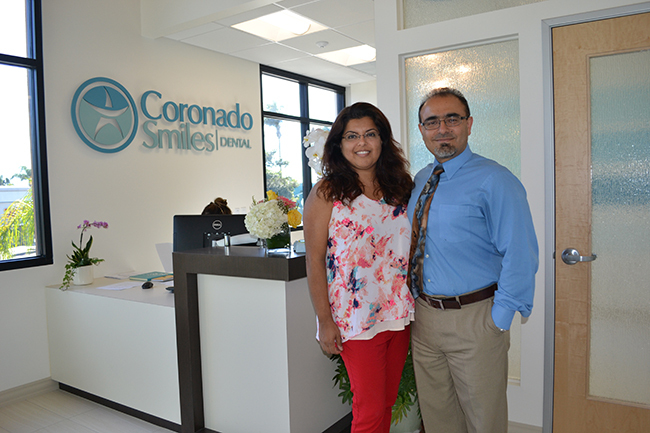 “Our whole world is here in Coronado,” Afshar said. Yassini, board certified in family medicine, integrative and holistic medicine, is fellowship trained in metabolic medicine, anti-aging and regenerative medicine. He has been practicing in Coronado since 2000, most recently at his office on the Sharp Coronado Hospital campus. One of his specialties at Peak Health Group is bio-identical hormone therapy. He is joined in his practice by nurse practitioner Susan Rinelander, a resident of Coronado. “Susan was working at Balboa Naval Hospital, but her heart, like mine, is in holistic care,” Yassini said. Rounding out his practice are two medical assistants and business manager Juli Lindquist, also a resident of Coronado. Susan Rinelander, nurse practitioner, and Dr. Patrick Yassini stand ready to welcome patients to the new Peak Health Group office.